The brilliant scientist Andross was exiled to the planet Venom for crimes against his home world of Corneria. Now Andross has amassed an army and has spread his tyrannical rule over the Lylat System. Now Corneria is under attack, so Fox McCloud and the Star Fox team are sent to destroy Andross once and for all. The Arwing has some new moves: It can spin to deflect enemy fire, perform loops and U-turns, lock gun fire onto enemies and enter "All-Range Mode" for arena battles. A number of missions require you to pilot other craft, including the Landmaster tank and the Blue Marine sub. Missions may have more than one path, leading to different planets on the map. Taking out a lot of enemies rewards you with medals. Star Fox 64 was the first game to use the Nintendo 64 Rumble Pak accessory, and was packaged with it. Plug the Rumble Pak into the Nintendo 64 controller port, and your shots and damage will be fed back as vibrations into the controller. Since then, "force feedback" has been built into most videogame controllers as standard. 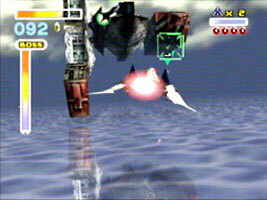 The boss of the Sector X stage is a giant, incomplete robot known as "Spyborg" in English versions of the game, and "HVC-09" in the Japanese version. HVC is the serial code for the Famicom, and all Famicom hardware features the serial code of HVC followed by a number. Some numbers are not used, typically because the hardware was never completed or released. One of these unused numbers is HVC-09. In fact the next used code is HVC-12, R.O.B., the Robotic Operating Buddy. It is likely, given the resemblance to R.O.B., and Spyborg's cries about searching for its creator so it can be completed, that it is based on a R.O.B. prototype that was never released.